So I feel I should, in the interest of full disclosure, preface this review with a full and frank admission. I have never been the biggest fan of musicals. There, I said it. I would even go so far as to say that they really just “aren’t my thing” as I flick my hood up, put on some Arctic Monkeys, and go on pretending to myself that I’m vaguely cool. Now this honest confession may dissipate or intensify your interest in this review, but at least I can go to bed tonight safe in the knowledge that you were never given false pretences, dear reader. Despite all that I’ve just said, I did however go into this production with high hopes. The 2003 film that it is based on has been a firm favourite over the christmas period since it came out, and I would go so far as to say it is a bit of a modern classic that will go down in the essential Christmas canon for a long time. And for the most part, I wasn’t disappointed. Elf is the story of Buddy, a human man who works at Santa’s Grotto in the North Pole. As a baby, Buddy had snuck into Santa’s when Old St. Nick had visited Buddy’s orphanage, and was mistakenly taken back to the North Pole, and consequently raised by the worker elves. As result, Buddy believes himself to be an elf, despite being double the size of the largest elf there. After finding out the truth, buddy goes on an adventure to the mystical land of New York City in order to find his real family, and spread some Christmas joy on the way. The sets were fantastic, the singing note-perfect, the transitions seamless, and the whole production carried such an overwhelming sense of joy and spirit that it would make even the Scroogiest Scrooge smile. I absolutely loved the live music, timed so perfectly to the choreography and adding such gravitas to the proceedings. In terms of songs, a highlight for me was the jaded mall santas singing in a dingy Chinese restaurant about the lack of Christmas cheer in New York any more, which added a nice juxtaposition to the other cheery numbers. 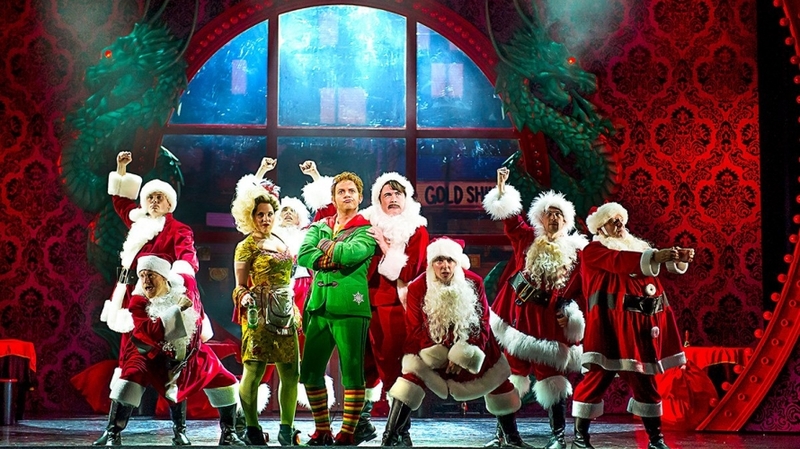 In terms of the characters, the show belongs in most part to Ben Forster in the main role as Buddy. He soaked up the stage with his energy and charisma, and watching his hilarious interactions with the day to day working people of New York was certainly one of my favourite aspects of the show. I also really enjoyed Joe McGann’s gruff, Scrooge-like ‘Mr Hobbs’ adding as a perfect foil for buddy’s at time overwhelming enthusiasm. And a shout out must go to the conductor’s brief cameo as a narwhal. Tony Awards, watch out. There were minimal drawbacks. The show did start 30 minutes late due to undisclosed reasons, I would also personally have liked to have seen more between Buddy and Jovie. And I have to admit, I’ve never been of the opinion that a musical version of a non-musical film improves it, and this production hasnt changed my mind on that. But I do like that they made it their own and did try and whole-sale take the dialogue from the film, only the stand-out lines remain (“Hi I’m Buddy, what’s your favourite colour?”). So all in all, I came away with a smile on my face, which was all I was hoping for. Kids and adults seemed to squeal in delight in unison all evening, and the standing ovation at the end spoke a thousand works. Santa said to us all at the end, “Happy Christmas to all, and to all a good night”, well I certainly think that Christmas wish came true for the audience I was sat in.